The federal government has designated a growing wine grape region on the border of Washington and Idaho as the Lewis-Clark Valley American Viticultural Area. The appellation sits in a geographic region known as the “banana belt” for its high temperatures compared with surrounding areas. Almost 150 years ago, farmers who had immigrated to the Unites States from France and Germany were successfully growing wine grapes in the region around Lewiston, Idaho, and Clarkston, Washington, until Prohibition halted production. The industry there has been slower to return than in other parts of the Pacific Northwest, but today, the Lewis-Clark Valley is home to three bonded wineries and 16 vineyards growing more than 80 acres of grapes. To those growing grapes and making wine there, it’s not just another grape growing region. “This is really an amazing place to grow and make wine. I can’t think of any place I’d rather be right now than here,” said Coco Umiker, winemaker for Clearwater Canyon Cellars in Lewiston. Her husband, Karl, manages the winery’s estate vineyards. “My husband and I really could have gone anywhere, but we decided to plant our flag here in Lewiston on our family farm, not just because we have family here, but because we really believe this is a premier place to grow and make wine,” she said. In announcing the designation, the Alcohol and Tobacco Tax and Trade Bureau also modified the boundary of the existing Columbia Valley AVA to eliminate a partial overlap with the new Lewis–Clark Valley AVA. Surrounding the Lewis-Clark AVA, temperatures are cooler, rainfall is higher and elevations are higher. Its steep canyon walls, plateaus and bench lands differ from the rounded, rolling hills of the Palouse region to the north or the rugged mountains to the east, south and west. Alan Busacca, a leading expert on geology and soils who helped craft the Lewis-Clark Valley application, said the region has fabulous growing conditions for Vitis vinifera, or wine grapes. “It’s sort of the buxom of the Bitterroot Mountains, where you wouldn’t expect to have a place that is warm enough and would have the right conditions for growing grapes,” he said. Culturally, the area is significant as a refuge for Meriwether Lewis and William Clark during their expedition from 1804 to 1806. It’s where the Nez Perce sheltered and fed the travelers following an arduous trip across the Continental Divide. In the broader geologic and geographic sense, the region is distinct from much of the surrounding area in one specific way, Busacca said. In much of Washington’s neighboring Columbia Valley, ancient floods released from a glacial lake near Missoula, Montana, sculpted the landscape, dumping gravel and silt in their wake. The soils there have been formed directly from the sediments dropped by the glacial floods. By contrast, the Lewis-Clark valley is a product of the mountain building and river cutting of the Clearwater and Snake rivers. Soils being farmed in the region have been formed from a secondary product of the flooding: the windblown silt, loess, since the end of the floods. “It settles one dust storm at a time, to form soils up on the canyon walls, up on the Lewiston orchards, and the Clarkston heights,” he said. The result is mineral composition that is similar, but the mode of formation of the soils and how they sit on the landscape is different. Jim and Dana Arnett, owners of Arnett Vineyard in Clarkston, grow roughly 2 1/2 acres of wine grapes in sandy loam, at an elevation of 840 feet at the center of the vineyard. Another 3 1/2 acres will be added to production next year. Jim Arnett planted his first grapes in 1999, and in the years since has learned much about the varietals that like his site. Namely, reds. The whites are not happy there. 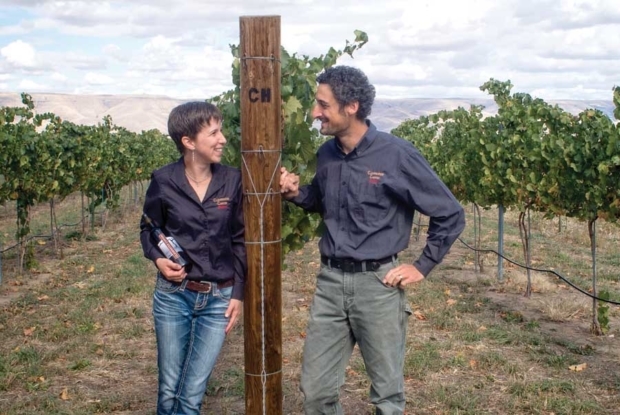 Arnett sells grapes to Clearwater Canyon Cellars, which opened in 2004 and gets 75 percent of its grapes from vineyards in the Lewis-Clark Valley, including its own estate vineyard.